This home is truly a golfer’s delight, located on the third fairway of the Oak Creek golf course. 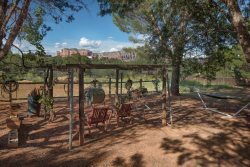 From the patio, living room and Master bedroom, take in the view of the golf course with a backdrop of red rock, including Castle Rock. The home has an open floor plan with a fireplace, new sectional & T.V., internet access, and a two car garage. It has three bedrooms all with queen sized beds, and two full baths. A very comfortable home with all you need at a reasonable price. Staff were friendly and helpful. Thank you! We loved our home away from home! The personal touches (flowers, personal products laid out with guest towels, etc.) made the home so inviting and us feel welcomed and special. Our neighbors were wonderful. Our home was beautiful and met our needs perfectly. The only issue we had that it was slightly inconvenient to pick up the keys at the office in West Sedona and then drive all the way back to Oak Creek to the house. Most rental places now have a lockbox on the property or coded security system to get in. It was a minor inconvenience, however. The team was very responsive with all my questions. The house was a really pleasant surprise. It was very affordable, comfortable, and the kitchen was more fully stocked than any other house I've rented before. The property had great views and was comfortable for all 6 of us during Thanksgiving.